Satoru Iwata celebrates 25 years of gaming history at this year's Game Developers Conference. Nintendo's President since 2002 is about to take the stage at the Moscone Convention Center in San Francisco to give his speech entitled "The Wind Beneath My Wings" ... err, scratch that, it's called "Video Games Turn 25: A Historical Perspective and Vision for the Future." I'll be giving you the play-by-play here just in case you can't listen in on your own. Megan Scavio, Director of GDC, on stage now about to introduce Mr. Iwata, but she is busy wishing happy birthday to a great friend of GDC. Great introduction about all of the innovations that Nintendo has brought to the table this decade. 12:04 Iwata looking dapper in his all black suit! 12:05 He says that one of his biggest jobs is talking to press and financial advisors, but he loves coming to GDC because he can talk to his colleagues face to face. 12:05 Iwata starts off by talking about the volatile place that videogame industry is under right now. Quotes from Chris Taylor from GPG and Mike Capps from Epic Games about how "we're all taking bigger gambles." 12:07 When he was at Hal Laboratories (Kirby), Iwata said he thought he knew all about videogames. He even thought his games were all technically superior to Shigeru Miyamoto's games. 12:08 He used to think that programming was the only part of videogames that mattered, but when Miyamoto's games outsold Iwata by a huge margin, he realized that imagination was more important than engineering. 12:09 "I was ashamed. To use an English expression, I lost my attitude." 12:11 He started out back when designers were young hobbyists, but Iwata says that they were like gaming cavemen. 12:12 Everything has changed, a budget of a million dollars for a game used to be unthinkable because it was too high. Nowadays, that's a pittance. 12:12 Because of the increased risk, Nintendo needed to learn what games would sell. To accomplish that, the company conducts surveys across the world to get a better sense of what were areas of growth for the gaming industry. 12:13 Iwata said to the gathered developers, "You are the center of the videogame universe." 12:15 The Wii and the DS were instrumental in increasing the videogame audience in the US. And he thinks that the numbers indicate a chance for more growth. So at least we got that going for us, which is nice. 12:15 Everybody is talking about social games and social networking. But these kinds of games have been around for a long time. 12:17 Iwata mentions MUDs and text-based gamesx as social games, even without graphics they were very popular. 12:17 As Atari 2600 and more consoles in the 80s, Nintendo has always been on the cusp of multiplayer. In the 90s, the Nintendo 64 was the first console to support 4 controllers out of the box. 12:18 In those days, being social only meant competing. 12:19 "I don't want to make it seem like Nintendo is the only company taking credit for making social games." Iwata called out COD and Microsoft for expanding "social" games. 12:20 It's important to figure out what drives videogame sales. 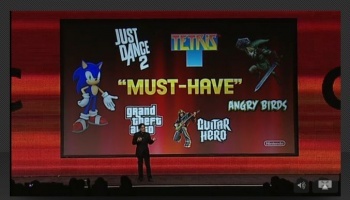 Iwata then showed a huge slide that read "Must-Have." The kind of game that you feel left out if you don't have it. 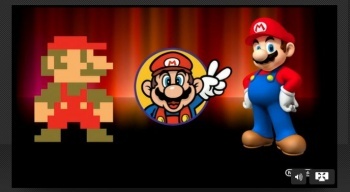 12:24 The reason that Mario is popular throughout the ages is because it has always changed. 12:25 Tetris was the first attempt to cater to the female audience. Six months after the Gamboy released in 1989, 40% of all Gameboy players were female. 12:26 Shout out to The Sims for selling more than 100 million copies worldwide, even though many critics questioned whether it was even a game. 12:27 It's important to challenge what a videogame is and how it should be played. 12:28 Universal appeal is really important. Iwata said to make sure to attend the panel on how Donkey Kong Country became a worldwide hit. 12:29 When Kirby first came out in Japan, it only sold 26,000. Nintendo was interested in the game though and agreed to publish it in the West but it was important to make sure that it appealed to Western audiences. 12:30 The title of Kirby if translated literally would have been Tinkle Popo. "Not a really great title." 12:31 The marketers in the U.S also changed the color of Kirby on the box from pink to white. "Maybe they thought I wouldn't notice. I did." 12:32 Regardless, the bugs were ironed out and the game ended up selling much more than 12k worldwide because of its universal appeal. 12:32 With the 3DS, Nintendo is trying to jump on the Must Have. They want people to show their friends, "Look at that! I need one of those!" 12:33 Our wifi connection with handheld games has not been awesome. They are working on trying to overcome those problems in Europe and the US. 12:35 Nintendo President of America Reggie Fils-Aime takes the stage. 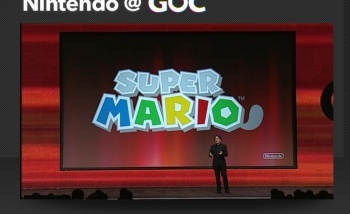 Ugh, it feels like Nintendo is using this "keynote" as a marketing presentation. 12:38 Yep. We're getting a a data dump of 3DS features here. 12:39 3D video recording confirmed. 12:41 "Just like the auto industry, test drives drive sales of the 3DS," Reggie just said. Do you really want to compare yourself to a failing manufacturing industry? 12:41 Over 10,000 AT&T hotspots added to restaurants, and airports specifically available for the 3DS. 12:42 The content available will be pushed to your device without needing to have the physical game cartridge. 12:43 Mentioned before but just getting to it now. You'll be able to use your Netflix streaming account from your 3DS to watch movies on your big flatscreen TV. That's a pretty handy trick and might be the Must Have feature for me. 12:44 Reggie appealing to the designers in the room. "These connectivity features will allow you to push your work." "I think that's win-win." 12:47 Every version of Mario has tried to bring new features or gameplay to the table. The same will be true of the 3DS. About to announce a new Super Mario!!!!!!! 12:48 The Galaxies team is working on a Mario game for 3DS right now. 12:49 Iwata won't say what the tail in the logo indicates, but we'll learn more at E3. 12:51 We also got a glimpse of a trailer for Zelda Skyward Sword. Link is fighting stuff. Yay. 12:52 Iwata wants to conclude talking about the future. He thinks that developers have lost a sense of craftsmanship. Designers don't spend as much time as possible polishing and crafting a game until it is a work of art. 12:53 He doesn't blame designers, but rather the circumstances of budgets and publisher pressures. 12:54 The other problem that Iwata wants to overcome is developing talent. Many of the positions in game development are very specialized, artists only do art, tech only works on code. 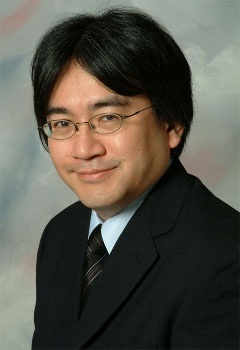 When he started, Iwata said that everyone was a generalist and able to do a wide range of role sin game development. If we become too specialized, where will the next great videogame savant come from? Seems to be an endorsement for indie development like Minecraft. 12:56 Iwata is also concerned with too many games flooding the market. He showed a graph that displayed the huge amount of games available and how its grown in the last five years. Many of these will fail, and it's becoming even harder to make a "hit." 12:57 The value of software is Nintendo's focus. That's why they don't publish games on other platforms, because they think that games made specifically for their hardware is the best way to make good games. "We are a game maker first, and a console manufacturer 2nd." 13:00 For many publishers, quantity is more important than quality. 13:01 Iwata ends by giving a few guidelines on how to break through the noise of many games. The first sequence of a game must capture attention immediately. If you dont' grab the player in the first ten minutes, then it may be already too late. If it's a strong experience, then it will also get people talking about a game. That kind of word of mouth marketing is more valuable than advertising. 13:03 All this can be summed up in one word: Innovation. 13:04 Closing Platitudes: Trust your passion; believe in your dream. 13:05 "For 25 years, game developers have been making the impossible ... possible," Iwata said. "Why would we stop now?"